For six weeks this summer, 18 students from Baltimore-area community colleges, Gallaudet University, and Morgan State University worked as full-time scientists at UMBC. 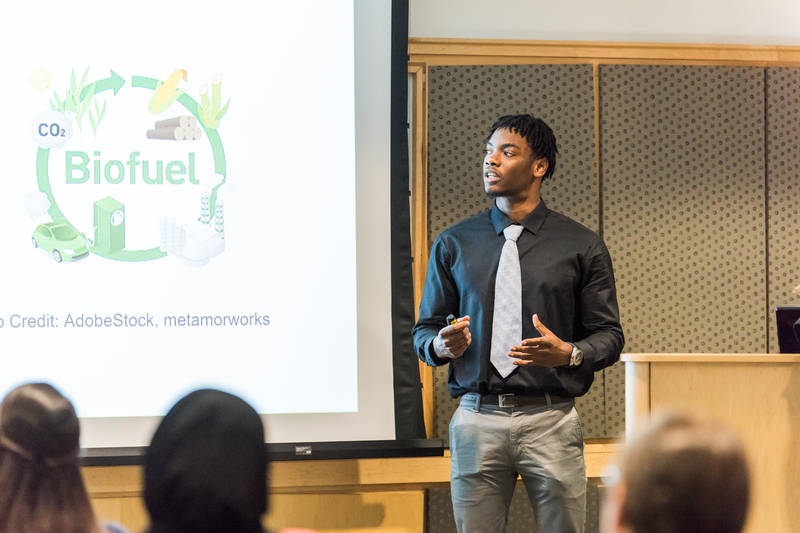 Their paid summer research experience was part of the BUILD a Bridge to STEM internship, an arm of UMBC’s STEM BUILD initiative funded by the National Institutes of Health under the Diversity Program Consortium. The students worked in small teams to learn biomedical techniques and tackle real research questions with the guidance of faculty mentors. Like professional scientists, they shared their progress in lab meetings, discussed research papers in a journal club, and formally presented their work at a research symposium. Mercedes Burns with her lab group at UMBC. 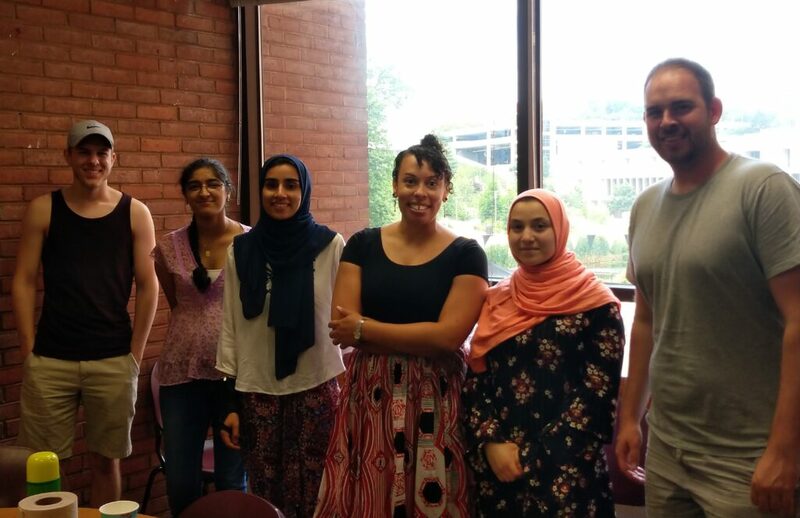 From left to right: Daniel DeWaters ’18, Mayukha Pakala ’18, Zulekha Karachiwalla, Mercedes Burns, Rahaf Alhabashi, and Michael Mercado. Photo courtesy Mercedes Burns. Karachiwalla, Alhabashi, and Michael Mercado, a senior at Gallaudet University, formed a research team that worked with Mercedes Burns, assistant professor of biological sciences at UMBC, to conduct research examining the genetic diversity of harvestmen—commonly known as daddy long legs. The team format epitomizes the BUILD Group Research paradigm, a key component of BUILD at UMBC. Through their lab experience, the students learned skills like how to keep a lab notebook and conduct experiments safely, which will serve them throughout their careers. “We’ve had to learn hands-on skills related to dissection and using different types of microscopes,” shares Mercado. He is confident those skills will be helpful as he pursues dental school. Karachiwalla also found the internship to be helpful in thinking through her future career goals, and the best route to get there. After considering several different potential majors, “this internship has definitely shown me that the career path I want is not just biology or computer engineering—it’s putting them together,” she says. Joseph Forbin presents his group’s research at the BUILD a Bridge to STEM final presentations July 19. His group worked with UMBC biologist Jeffrey Gardner to test designs for a new research tool. Photo by Marlayna Demond ’11 for UMBC. Burns is proud of all the team has accomplished in such a short time period. “They all really hit the ground running,” she shares. Thinking back to a day the whole group spent in the field, she says, “Seeing a diverse group of students and ASL interpreters having fun collecting arthropods was just awesome.” It may have been a short summer experience, but, she says, the way they collaborated so successfully to progress in their research gave her a feeling of “real pride” and excitement for the future. Banner image: Michael Mercado (left), Zulekha Karachiwalla (center) and Rahaf Alhabashi (right). Photo by Tim Ford.